My son has a very large bear and he likes to carry it around the house with him and cuddle it. 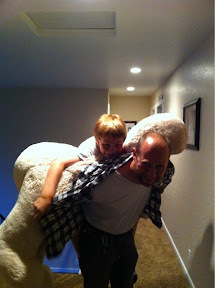 On this particular night, he wanted his dad to piggyback him AND his bear to bed! Jesus, carry me!! Say That Again, you are here, and You will piggyback me through the joys, challenges, adventures, and obstacles of life. Aren't Dads the greatest...such a example of God's love for us when he carries us. My husband has piggy backed all six of our children...he is feeling it now at 57 with child number 6, but that hasn't stopped him...I grin every time. Thanks for sharing I will remember this too when I see him carrying our son off to bed.